Whether it is a pipeline, a fracked gas well, or an incinerator, there are countless examples of corporations moving projects forward despite community resistance and environmental impact. Why? How has law evolved to protect corporate interests and what are a community’s options? What is a Home Rule campaign and why is it necessary? Explore these questions and more with a weekend with front-line organizers from across Pennsylvania. This is a workshop for those engaged in protecting their community from environmental threats for education and strategic planning. 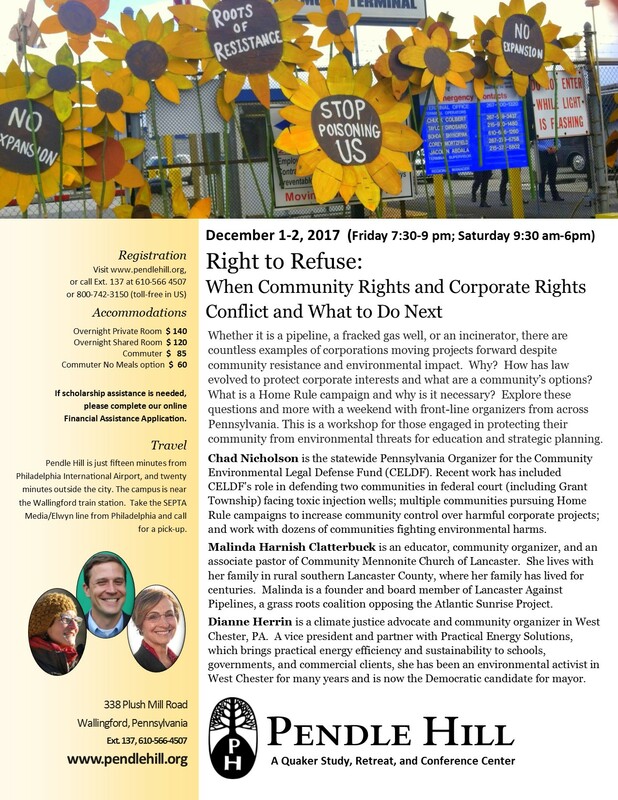 On Sunday, December 3 at 11:45 AM in Whittier Room, George Alexander will speak on The Mariner East 2 pipeline: how it came to be, why it is so bad, and what we can do about it. Perhaps you have heard about the Mariner East 2 pipeline, which is under construction in Delaware and Chester Counties. In full operation, this would be by far the most dangerous pipeline in the state of Pennsylvania. A rupture and explosion would destroy structures thousands of feet away and, depending on where it happened, could kill hundreds of people. How was this permitted to happen, and what can we do about it now? George Alexander will present background on the pipeline and outline what can be done. Rich and Claudia Aldred will speak about their experience as homeowners in the “blast zone” of the pipeline.